Quality Home Improvement, Inc's Kitchen division serves all of Southern California. We specialize in creating beautiful kitchens. Quality Home Improvement, Inc's Kitchen division serves all of Southern California. We specialize in replacing your old kitchen cabinets with new and updated cabinets. Over 80% of our kitchen projects have been completed for under $15,000. 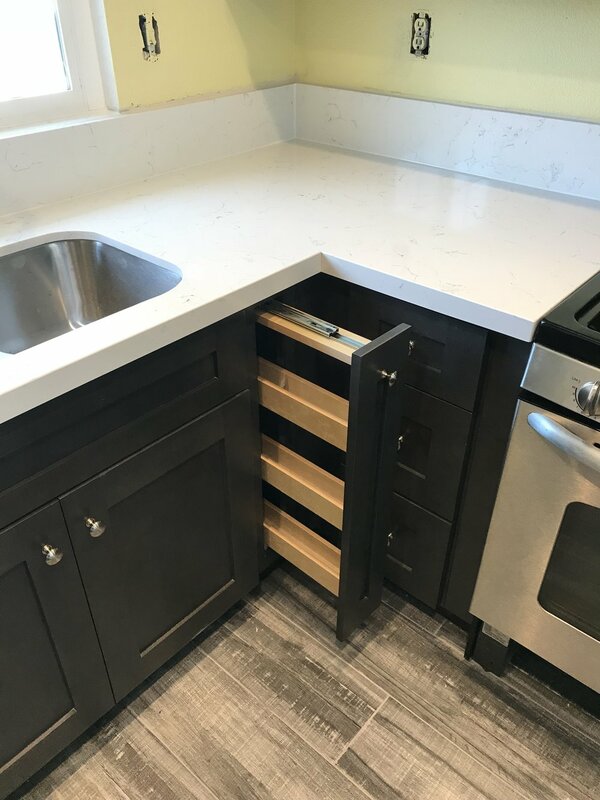 This includes all real wood cabinets, quartz counter tops, stainless steel under sinks, faucets, back-splash and includes professional installation. We have many different wood species including: maple, oak, walnut, birch, beech, cherry, rubber-wood, and basswood. 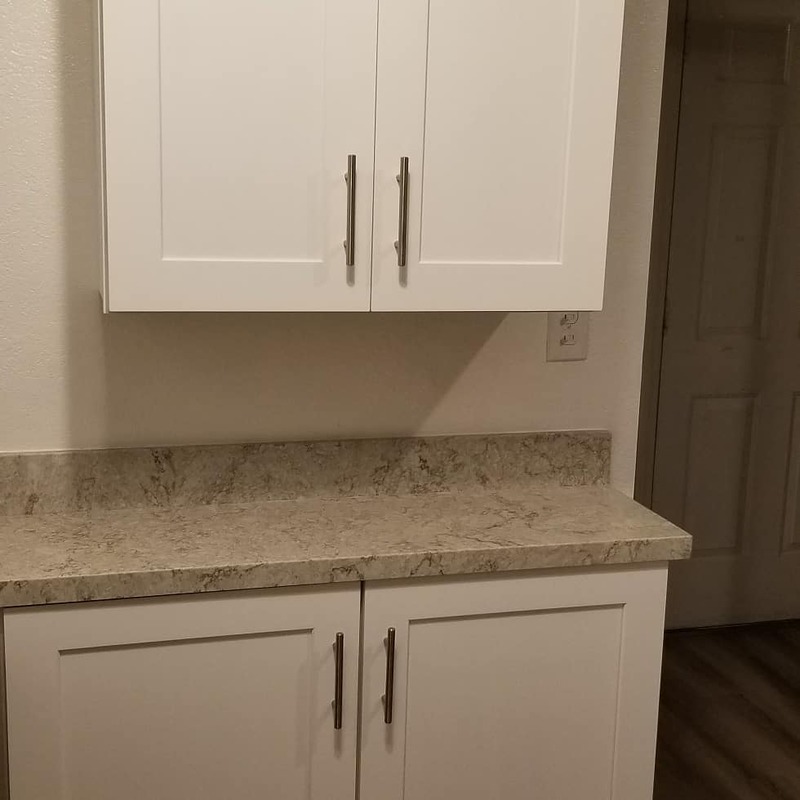 All of our cabinets have "no particleboard". However, many of our styles are actually less expensive than particleboard prices. Wood cabinets at particleboard prices - it's an easy choice! We have sold and installed many kitchens in the past five years. Most kitchens are installed in under a week, and the counter-tops in one day. Less time without your kitchen means less stress for you. We will gladly work with Contractors, Property Managers, House Flippers, Investment Property Entrepreneurs and Homeowners. The estimate is FREE and includes an in-home discount and easy financing options available to you. Click here - To view some of our custom cabinet colors, faucets, vanities and sink selections. Quality Home Improvement just finished another customers kitchen in Yucaipa California. 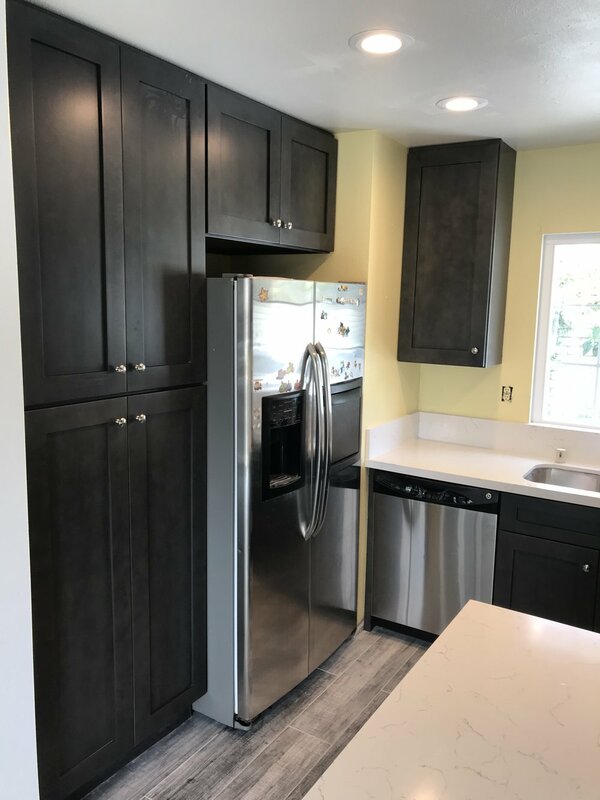 WHAT WE INSTALLED - CAN Lighting, custom white shaker cabinets, a quartz counter top, glass fronts on a couple of upper cabinets, laminate flooring and a beautiful back-splash! We took this families old 80's look to the next level and brought this kitchen into the current decade. 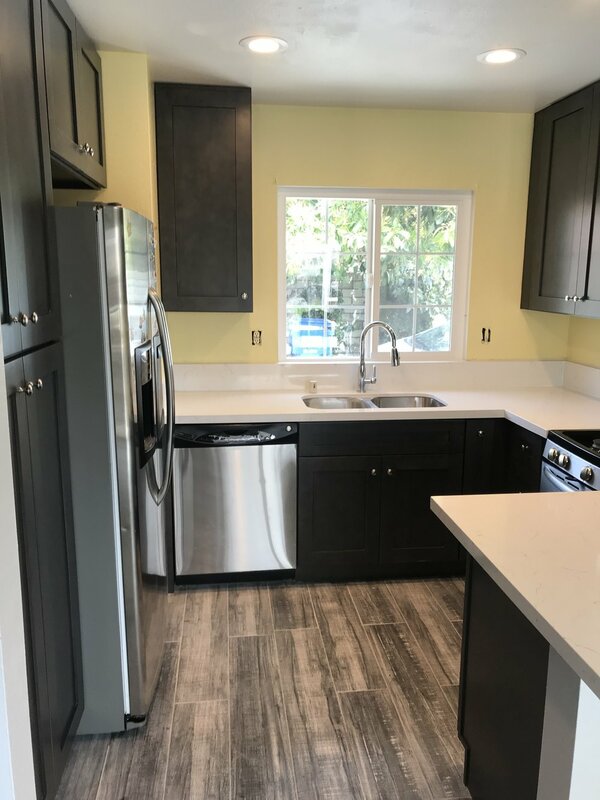 The old kitchen was just tired and needed some serious TLC, so we installed ... Laminate flooring, CAN lighting, Espresso Colored Cabinets, added some new fancy kitchen cabinet features, a nice Quartz counter top and topped it off with some new Anlin double pane Windows. Her home now has a great curb appeal with those nice windows and a new workable kitchen, ... We are both very pleased with the results! Fontana California get's a new custom kitchen installed - In the community of Southridge, this family got a total kitchen remodel which included some top-of-the-line Samsung appliances to go with it, this installation only took (8) days to complete and they were very pleased with the results. We did such a good job, they also let us install both of their bathrooms and waterproof laminate flooring - More videos to come. We took this families old 80's style kitchen and brought it into the modern age of today. This house was built in 1986 and it needed lots of TLC, we did such a good job with the kitchen we also transformed both of their bathrooms as well ... Then we did the laminate flooring throughout the entire house, new doors, baseboard, removed the popcorn ceilings, added six inch can lighting in the living room and hallway and painted the entire house. Next up, the backyard - Stay tuned for more videos! We took this families old 70's look to the next level and brought this kitchen into the current decade of 2018. The old kitchen was super dark and needed some lightening up, so not only did we tear out the old black tile floor, we matched it to the current wood looking living room floor, then we installed six inch can lighting for the final touch. ... We did such a good job, we installed new Anlin Windows and a new owens corning composition roof. More videos to show on this customer - Stay tuned for more videos! Looking for Kitchen Cabinet Replacement? Call Us! Need to Upgrade Your House? We Can Help! ARE YOU READY TO TURN YOUR KITCHEN INTO THE PERFECT SPACE YOU HAVE ALWAYS WANTED?